“Guru Puja” is a very important day in the life of every disciple. It is a day to express gratitude in the lotus feet of Gurudev for all the divinity he has bestowed upon. Divya Jyoti Jagrati Sansthan (DJJS) celebrated this auspicious day with vigour and sentiments. 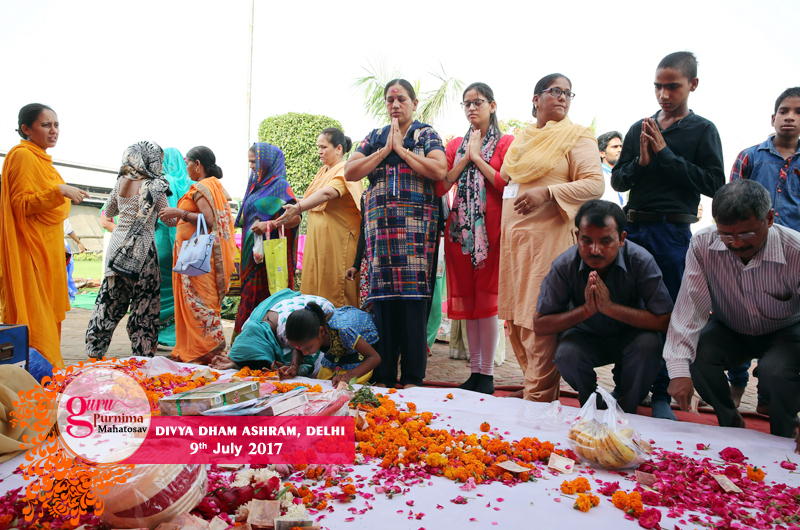 Thousands of devotees gathered in Divya Dham Ashram, New Delhi on the great grand occasion of Guru-Puja on 9th July, 2017 to celebrate the day and express their love and gratitude towards “Gurudev Shri Ashutosh Maharaj Ji”. “We are privileged to have Shri Ashutosh Maharaj Ji as our Spiritual Mentor who has bestowed upon us the art of unison with that One (God) through the eternal technique of Brahm Gyan. He has truly led us from darkness to light and showed us the way to salvation. Words will always be less to express our gratitude towards him.” Each and every disciple at the Congregation was filled with such emotions. Everyone carried in their heart the feeling of gratitude towards Gurudev. This epoch is fortunate to have revered perfect spiritual master - Shri Ashutosh Maharaj Ji who has not just mastered this rare science of Brahm Gyan but has also revealed and made it accessible to the masses which is again rare or may be first time in the history of mankind. He has awakened new aspirations in the hearts of those that listened to him. When he speaks, he fills the hearts with the rich music of his wise words, and the richer music of his heart. In him, intellect is blended with eloquence, accentuated with spiritual fire. He has preached the great truth of salvation through communion with God. He has shown the vision of the unity of all. The divine music and the series of spiritual discourses delivered by the preachers of Shri Maharaj Ji illuminated each and every disciple. The congregation was entirely immersed in the colours of Guru-Bhakti. Emotions flowed from heart. The divinity in the day could be felt by every individual. The blessings of Gurudev could truly be felt. Words are always insufficient to describe what role a Guru plays in the life of a disciple. None can repay a spiritual master. His effulgence, his radiance, his holiness, his transcendence, cannot be chained in words. Indeed, there is no difference between God and the Guru. Because God chose to be invisible, He created Gurus. In him, we beheld the beauty and blessedness of the life that is lived in the Eternal God. Our relationship with the Guru is one of the most important and powerful equations that we are likely to have in the world. The Guru is elder brother/sister, guide, friend, mentor, father, mother, God. The chemistry between a Guru and his disciple will ever remain a mystery. How can one say what clicks or tick between them? It is too deeply divine to be fathomed. There is no one you can be closer or more intimate with than the Guru, because he has let go of all defenses, masks, and shields. Free of all physical, emotional and psychological need, he loves unconditionally. Guru has the unfaltering patience even with the most obtuse, his compassion and humanity with those in trouble, his respect for all, no matter how erring, and we are not just inspired, but transformed. It proved to be yet another important day in the life of disciples and gifted each one the treasure of Guru Bhakti, Determination and Enthusiasm.